In the event you missed John Lennox on April 14, 2015, be sure to catch his talk, "The Loud Absence: Where is God in Suffering?". NOTE: Parking is no longer free on evenings and weekends on the UCSB campus. Please review the instructions for use of the "Pay By Space" permit dispensers, which have been installed in all UCSB parking lots. Use the UCSB Map to find the most convenient parking lot. WHAT IS THE VERITAS FORUM? From the Latin words meaning "a public discussion of truth," The Veritas Forum is an opportunity for the entire community to openly explore and discuss the most important questions of the university, society, and the human heart. We are bringing together qualified scholars, philosophers, and thinkers from diverse fields and backgrounds to dialogue on crucial issues. The Veritas Forum comes out of our community earnestly exploring questions of importance and seeking answers to the deeper (integrated) questions of life. We explore truth and life as we seek to connect the relevance of the person and story of Jesus Christ to all of life. 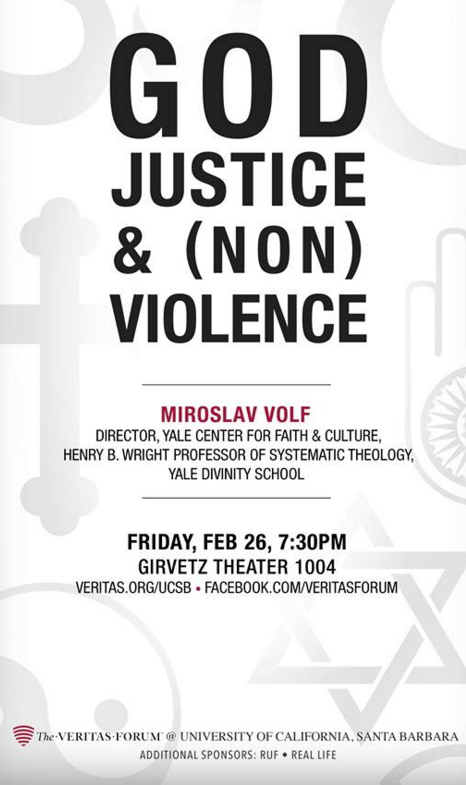 Veritas is an opportunity to come together and discuss these issues. Come explore true life with us.